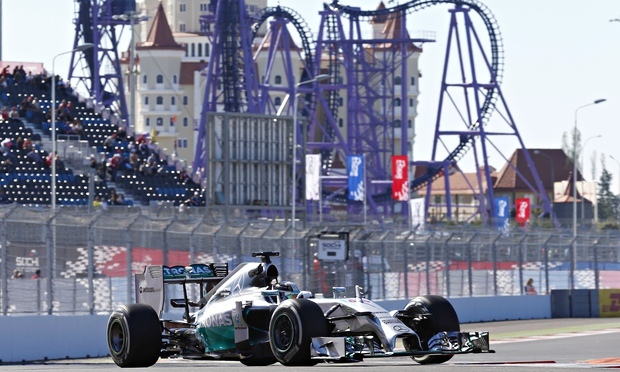 MERCEDES WIN 2014 CONSTRUCTORS’ CHAMPIONSHIP IN SOCHI. Pre-race, it was a good atmosphere around Sochi. The sun was out again, which gave good track and air temperatures. For the first time in a while, there was no indication on pit stops, pace or how anything was going to play out. There was a photo opportunity with the Marussia team to show Jules Bianchi’s family how much support he is being given, the team holding a pit board with “we’re racing for you” spelled out on it. Kvyat in the Toro Rosso was getting a lot of fan attention as the cars were being prepared on the grid, starting from 5th in an excellent qualifying on Saturday. Slightly peculiar was the request for all drivers to line up on the start line and for complete silence to fall in order to respect the Russian national anthem. A bit odd to watch, especially as the drivers need to mentally prepare themselves for the race. Would we see a safety car for this race? There was one in the GP2 race on Saturday when a car stopped out on track, so it was likely that we’d see one here. Once the cars were prepared, the formation lap got under way, and the train seemed to be extremely long, much longer than it should normally be, meaning the cars at the front were sat waiting longer for the start of the race. The front row Mercedes cars were pointing at each other – Lewis Hamilton moreso aggressively than Nico Rosberg. The lights went out and straight away, it looked as though Hamilton had the jump, until they rounded the flat-out, very tame turn one, when Rosberg brought himself alongside Hamilton. For half a second, it looked as though Rosberg had the lead, but he outbraked himself – severely, tyre smoke and squeal – and ran wide in turn two, using the run off to gain a huge advantage, which his team told him straight away to give the place back to Lewis, as it was ruled that he had gained an unfair advantage by exceeding the track limits. His response was that he needed to pit as he had ruined his tyres and had terrible vibration – surely not another race ruined early on?! He did indeed pit at the end of lap one, as did the Williams of Felipe Massa running well down the order after a mechanical problem in qualifying. Rosberg went on to the harder compound tyres and on his out lap and in last place, asked what the plan was. “Run these tyres to the end” was the team’s response, which was a ludicrous thing to attempt. 52 laps couldn’t be completed on a single set of medium compounds, could it? Jenson Button didn’t think so. As Rosberg began to carve his way through the back of the field, with Massa in hot pursuit, Kevin Magnussen in the Mclaren began to reduce his grid penalty deficit by fighting his way up to 5th place, chasing the Ferrari of Fernando Alonso. Button was in turn trying to keep Alonso at bay, and hold on tight to his 3rd place, behind the Williams of Bottas and the leading Lewis Hamilton. Rosberg came on to the team radio to let his team know that he was “driving in a manner to get to the end of the race” – meaning he would have to look after his tyres for a very, very long time. Chilton came into the pits and without any urgency, Marussia decided to retire their man. Daniel Ricciardo was next in the pit lane for a very early stop on lap 12. Possibly trying to jump the queue that had formed in the back end of the top ten, where Vettel, Ricciardo, Vergne, Raikkonen and Kvyat were all separated by less than 3 seconds, after Danny had complained that he was “losing a lot of time” behind Sebastian. Upon exiting the pits, Nico Rosberg flew by and put Ricciardo into 18th place. Perhaps Rosberg could score some points here, even if he did have to stop again? Back out front, Lewis had developed a healthy lead over Bottas, who in turn was more than holding his own against Button. There was no major rush in 2 laps for stops, such as we normally see during other races. Firstly Kvyat pitted, which put him ten seconds behind Ricciardo, who he was battling with before the Red Bull driver changed tyres. Button then came ion for his stop and came out just behind – Nico Rosberg! Perhaps Mercedes’ calculations that they could still rescue a podium for Nico were correct? The question would only be answered with how his tyres would hold out. Alonso’s stop was slow as there was a problem with the front left wheel; this put to bed any chances he had of catching the cars in the podium spots. The really big story came when Bottas stopped from second. He was overtaken by Sebastian Vettel – who was yet to stop – and in the background of the shot was none other than Rosberg. A stunning drive to get him that far. Could his tyres hold on for half the race? Lewis Hamilton’s single stop was without drama and he came out in the lead, 17 seconds clear of the Red Bull of Vettel. Further back, Grosjean and Sutil collided at turn two; where for a brief moment it looked as though the Safety Car may make an appearance, before Sutil spun up his rear wheels, faced the right direction and went after the Frenchman. Sebastian Vettel was still running without stopping when Bottas and Rosberg closed in tightly on him. Vettel came in for fresh rubber by which point Rosberg was well within DRS range of the Finn’s Williams. Under braking into turn two, Rosberg this time didn’t lock up and went past Valtteri with ease. Second place meant that the only driver ahead of him was his main rival in the other Merc, Lewis Hamilton. All Rosberg had to do now was make sure his tyres got him to the end. Caterham’s Marcus Ericsson was running amongst the Lotus pair for a while, but Kamui Kobayashi was brought into the garage and retired – but Kobayashi didn’t seem to know why the car had been retired, whether or not we’ll see him in Austin, or indeed for the rest of the season. Worrying times for Caterham and Kobayashi. Has the money pool finally run dry? The last driver to stop for tyres was Esteban Gutierrez, which was a shame because Sauber were on for two points at the time he stopped. Their terrible season continues. Mclaren meanwhile were making the most of their afternoon by running 4th and 5th. Both drivers were in for a shout of a podium if Rosberg had to stop again. With that, the Mercedes driver’s lap times started dropping. He was 16 seconds down on his team mate, and after doing many fastest laps was beginning to fade. Was this the time for Bottas, Button and Magnussen to capitalise? They certainly gave it a go, as Button picked up his pace, before Bottas followed suit. Unfortunately though it was too little too late for them, as Rosberg wouldn’t be caught. Lewis Hamilton crossed the line to win and performed a Nigel Mansell-esque double punch, which was a nice touch if deliberate, as this brought him level with Mansell on 31 wins. It also meant that with the 25 points in the bag, Mercedes were constructors champions of 2014. Three races remain, but their dominance has been such that there is no mathematical possibility of Red Bull, their nearest rivals, catching them. Rosberg followed to complete the 1-2 finish and an extraordinary recovery drive to finish second. Bottas took the final podium spot ahead of the two Mclarens, resurgent on the Russian coastline this weekend. In terms of time, it sounds easier to hear that Rosberg chipped away at a 33 second gap at one point, to get it down to 18 by the end of the race, whilst clearing all of that traffic. What is more impressive is when you think of that in terms of distance, in terms of actual ground gained. Nico Rosberg was half a lap down at one point, which was just under 3kms. To make up 3kms of distance in approximately 30 laps means that Rosberg’s Mercedes was able to eat away 100 metres of tarmac per lap over the rest of the field. That is almost unfathomable, and is testament to the job that the Brackley based Mercedes team have done this year. When they really needed the pace, and it hasn’t been very often this year, they’ve unleashed one hell of a car, such is it’s performance that it could do very well next year too, much in the same way that Mclaren ran the ‘same’ car in 1999 that they had in 1998. Russia is used to travelling circuses providing endless entertainment and wonderment. This wasn’t a spectacle of a race, no classic inaugural Grand Prix to be spoken about for years to come. Infact it was a race more won and lost on strategy and pit stops. A hark back to the races of the late 90’s and early 00’s. The biggest, and perhaps strangest surprise was President Vladimir Putin hanging around the cool down room before the podium, asking questions and then presenting both the winning trophy to Lewis Hamilton and the team trophy to Paddy Lowe. So it’s congratulations to Mercedes AMG Petronas on winning the first of two titles this year. It is inevitable that they’ll win the second, but with Hamilton’s lead now 17 points over Rosberg; and double points available at Abu Dhabi, would you like to place a bet on who? Hamilton is favourite now, without a shadow of doubt, but we all know with the unpredictably of Formula One, that anything can happen. To Austin! DNF: Kamui Kobayashi, Max Chilton. Caterham F1 – Just what is going on?